With all the work that has been going on in our back garden (tree felling and french-drains being expanded) it upsets me terribly that from having a completely private back area, we are now seeing ugly walls and neighbours roofs! On the plus side we do have the view of our mountain back, but I prefer privacy. Not that they can look into our property – unless they stand on their roofs (which I haven’t seen them do) they can’t see into the property, but I just don’t like it. Frankly, I preferred the wild, overgrown jungle I had there before, but I know that in a year or two (or three?) I will be very happy that we had all this done. To speed things up a bit I purchased three trees that were planted today. 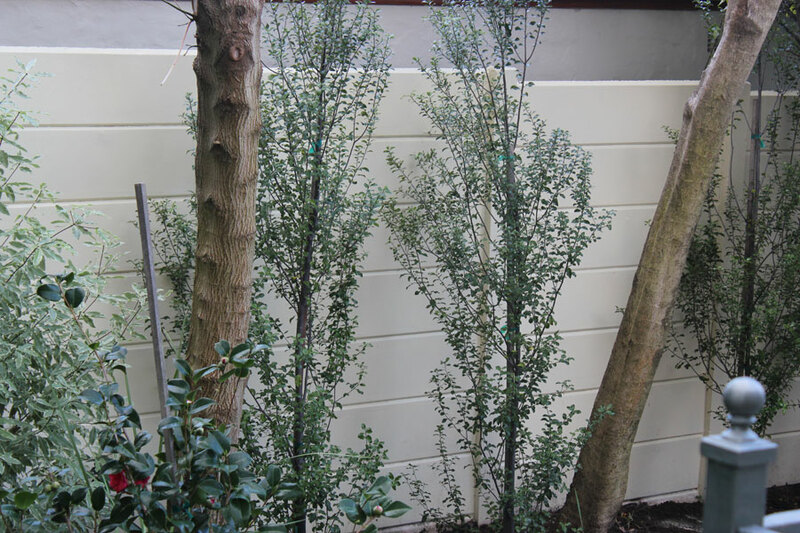 I saw three Pittosporum nigrescens planted next to each other at a nursery in Elgin – and fell in love with them. The owner told me she had planted them three years earlier and not done a thing to them. 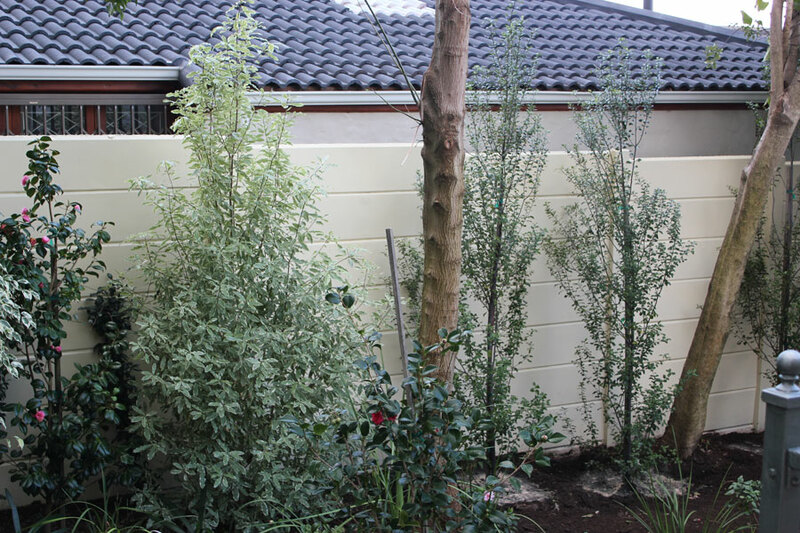 Very tall and narrow with beautiful foliage these trees are a good choice for the space I’ve put them in as they grown upwards and stay narrow without causing the deep type of shade some of the others do, and they create a screening effect. A bonus is that they won’t be dropping any berries into my neighbours’ gardens which has been a three year bone of contention between us. Note: In the second photograph, the Pittosporum eugenioides ‘Variegata’ on the left was planted ten months ago and was a fairly small shrub (two thirds its current size). It has grown a lot and bushed out nicely in the last ten months so I am hopeful the three new ones will do much the same. Hi Chris – they are the PERFECT pair!! Fabulous. It gives me an idea. I want to eventually hide my vibacrete wall at the back too. Hmmmmmmm! I just planted some trees for privacy too, so I guess we’ll have to be patient together and wait for our trees to grow up! They should be lovely though in a few years! Those trees are going to be stunning when they fill out a bit! I’m looking forward to watching their progress. I’m with you and Alan about the trees, though. We lost two huge pines in a Nor’easter and we were heartsick. We are replacing them both with Tuliptrees that sprouted in the midst of perennials we purchased a few years ago. (I’ll be posting about it soon, actually – they don’t grow here as a rule, not native to this area, and we think they traveled here in the soil of perennials we purchased!) Rather than treating them as weeds, we have nurtured them and are actually hiring someone to move them for us. We are choosing their permanent homes carefully though, to insure their long term survival. In our city, once a tree reaches 8 inches DBH, you can’t legally fell it without the tree warden’s permission. They are fine with trees that are damaged or disease, but they can actually stop you from chopping a tree you don’t like if it’s within 10 feet of a property line and provides shade to your neighbor’s yard. They also govern trees close to the roadway. Hi Cathy – I looked up Tuliptrees and they are spectacular! I like that rule about not felling trees your town has! Removing trees really breaks my heart. When we first got the landscaper in they told us to remove our pepper tree “because of all the shade and the plants won’t grow”! – well, its clearly very old, beautiful, and that was just not an option for me. I allowed them to cut it back (I cried when they did it). Fortunately now a year on and its looking beautiful again and plants are absolutely thriving underneath it – I’ll post a photo one of these days. It’s my favourite tree of all. Sometimes the logic of landscapers and contractors escapes me. I think they remove trees mostly to make their jobs easier – they don’t have to use care around them – and they make a profit selling the wood, too. I watched them totally decimate a gorgeous woodland area where I used to live to put in a 35-home subdivision. They felled virtually every tree. Now all the people are planting trees for shade. Hello… would it have been so hard to leave a few? You will be amazed in a couple of years how grown in your garden will be again. But I can understand your need to have that feeling of privacy. Very pretty! I have a row of junipers (skyrocket) along my fence. I primarily planted them for privacy, but they also turned out to be a nice design element. Yours have a unique color that I just love. Hi Michelle – I just looked up Juniperus scopulorum ‘Skyrocket’ and they are gorgeous! 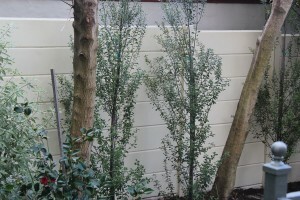 My tree nursery have them too -theirs are 2-8m in height. hmmm … I really really like them! A little remodeling in the garden always makes me happy. It will be rewarding to watch your space fill in. It looks great and I am sure the plants will grow in no time. I have black stem pittosporum and it grows pretty fast. nigrescens says ‘black’ but those leaves look blue or grey. The nigrescens refers to the branches I think which go black as the tree ages. But I will check it all out and blog it tomorrow. I’m not familiar with those trees, but they look nice already. Hi Alan – yes I quite agree!!! “Park your car somewhere else Lady”!! Who ever heard of chopping down an oak … it really takes all kinds doesn’t it! I love these trees – I wish I had a photo of the ones I saw in Elgin to show – the ones that inspired this purchase – they are just gorgeous when they grow up a little bit more. I’m very happy with them.